Beer Geek Joey, a friend of mine from Twitter, recently decided he'd like to step into the fray over here. Apparently, he has a beer collection that includes three versions of the 2007 J.W. Lees Harvest Ale--the original, one matured in sherry casks, and one matured in calvados casks. If you're really lucky, he might make this a trilogy (and we can also hope he curses like a sailor by the end, too). For now, the regular ale. 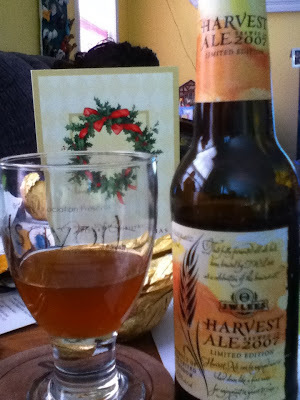 The Harvest Ale is produced annually in "limited quantity" (though it never seems to be hard to find), and is intended to be "laid down like a fine wine." The 2007 was produced at 11.5% abv, and comes in a 275 ml brown glass bottle. Aromas of raisins, fresh plums, port wine, molasses, demarara sugar, biscuit, muscatelle, and caramel. Sherry notes are prominent. Pours a slightly hazy red-gold, with almost no head, just a tiny collar of thin bubbles. When I got near the bottom of the bottle, lots of red-brown chunkies could be observed - probably yeast from bottle conditioning. No impact to the flavor between before the chunkies came out and after. Flavor mirrors the aroma, featuring dark stone fruit, dried fruit like golden raisins and apricots, sherry, port, molasses, biscuit malt and caramel. A bit on the sweet side still, but balanced enough to be drinkable. Very low carbonation, very viscous, heavy and creamy. Luscious mouthfeel overall. Very enjoyable sipper - not perfect, but a nice dram.